(VEN) - The establishment of the ASEAN Economic Community (AEC) is fast approaching, and with the conclusion of seven new-generation free trade agreements (FTAs) expected soon, great opportunities and challenges lie in store for businesses in Vietnam. 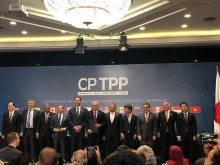 In his 2015 New Year’s letter, Minister of Industry and Trade Vu Huy Hoang said that Vietnam has concluded eight FTAs and is currently negotiating seven other new-generation FTAs including the Trans Pacific Partnership (TPP); the FTA with the Republic of Korea; the European Union (EU); the Customs Union of Russia, Kazakhstan and Belarus; the European Free Trade Area (EFTA) and ASEAN+6 partner countries; plus the ASEAN-Hong Kong FTA, which will all deepen Vietnam’s economic integration throughout the world. Regarding Vietnam’s commitments within the framework of the upcoming AEC, Hoang pointed out that the country already opened its goods market to ASEAN countries in the 1990s, and in all the intervening years Vietnamese businesses and goods still dominate the domestic market. “This proves that if we take careful steps, apply sound policies, and protect domestic production and producers’ interests, we shouldn’t be worried about opening up our market to the AEC on December 31, 2015,” said Vu Huy Hoang. The ASEAN Community will officially become operational on December 31, 2015, and will be composed of three central pillars – the AEC, Politics-Security, and Culture-Society. The Ministry of Industry and Trade has been assigned to work with related ministries and agencies to build an economic pillar. Ten member countries will have to complete their commitments in terms of trade and investment by that time, thus creating a common market for goods and investment and employment sharing opportunities. 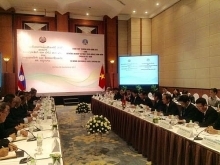 ASEAN countries have praised Vietnam’s preparations for the ASEAN Community so far. Vietnam has completed more than 90 percent of its commitments, putting it in the top three countries in terms of commitment fulfillment alongside Singapore and Malaysia, which have realized more than 80 percent of their commitments. Vietnamese Prime Minister Nguyen Tan Dung is the head of the steering committee on establishing the ASEAN Community, together with several deputy prime ministers who are deputy heads of this committee and are responsible for related issues. Their coordinated efforts are aimed at ensuring that the three pillars of the ASEAN Community are comprehensive in their scope, that there is consistent direction at central and local levels, and that Vietnam implements its commitments effectively. However, Vietnam and other ASEAN countries still have much to do to reach this goal, such as preparing human resources and technical and material facilities to implement their commitments. According to Vu Huy Hoang, Vietnam’s negotiations have followed the government’s direction and agriculturally-sensitive items have been protected in a rational manner. For example, when negotiating the country’s accession to the World Trade Organization (WTO), Vietnam struggled for continued protection of its agriculturally-sensitive goods such as salt, sugar, eggs, and tobacco, which remain protected in trade agreements following Vietnam’s entry into the WTO. Vietnam has also applied import tariff quotas allowing a specific amount of agricultural imports into Vietnam under preferential tariffs. Foreign agricultural products which are not subject to Vietnamese preferential tariffs must pay high taxes. “I want to underline that before the government came to a decision on negotiations over any FTA, it had already considered advantages from the agreement and devised plans or itineraries to protect domestic production in a proper manner so that Vietnam can deepen its economic integration and at the same time protect the domestic market and producers. This is our basic principle on negotiations. If it is done, I think that worries about fierce competition and a great threat to domestic production are baseless,” said Vu Huy Hoang. He added that many Vietnamese businesses believed that after the AEC is established they will have the opportunity to take their products such as textiles, garments, leather, footwear, as well as agricultural products and seafood to the wholesale and retail networks in ASEAN countries which will apply the same tariffs. In consideration of this, he said that businesses which have sound plans and strategies will see more opportunities than challenges.